One of my favorite parts about spending time in the woods is the night's sky. You simply don't get to see the stars for what they really are if you live in the city. There is just too much artificial light and it drowns out the stars. My first trip to the BWCA changed how I look at the sky and my understanding of just how many stars there are out there. That also means that if the stars and moon are shrouded in cloud cover you get to know a new meaning of darkness as well. Lying in my hammock on a cloudy night this last June, "pitch black" was the only way to describe it. I literally couldn't see my hand in front of my face. So, I reached for the little flash light I had dangling around my neck. I turned it on and it was like a searchlight blazing a trail through the darkness. I couldn't believe how bright this thing was. The little Fenix LD01 ran on just one AAA battery and easily illuminated a 10 foot wide path 30-40 feet ahead of me. The amount of light output is adjustable with a twist of the rotating regulating switch at the bulb end of the light. 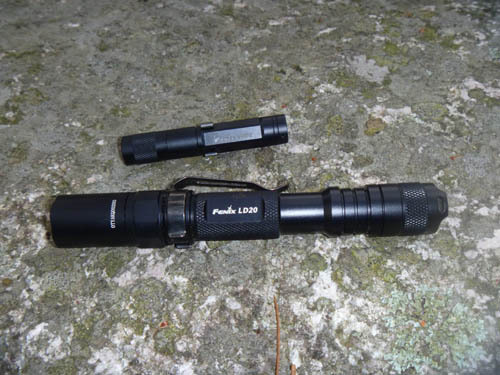 This little flashlight may be all I need for my future camping trips. Then there is the Fenix LD20, the big brother to the little LD01. Not Fenix's largest flashlight by any means, but I felt like I could signal the space shuttle with this one. With 5 different modes, you can dial in the right amount of light for any given situation. Throw this one in "Turbo" mode and make sure you don't point it at anyone you care about, because flash blind is an understatement. It also has a "Strobe" and "SOS" mode to help get you out of a jam if necessary. On one of my evening excursions for firewood with this light, it was like mid-day wherever the light was pointed and the rest of the world was swallowed by black. The rest of my crew told me when I returned that there was no chance I was getting lost, they could see where I was the entire time. "It looked like 'close encounters of the third kind' coming outta the woods" one guy said. I was utterly impressed by both of these lights. Battery consumption was not an issue, they lasted the full 6 days in the BWCA on just the batteries I loaded before we left (and I played with them a lot). Both are waterproof to 2 meters and rugged as heck. The LD01 took a fall, landing on a granite slab from about 25 feet. It may have gotten a couple of scratches, but that's it, still works like new. 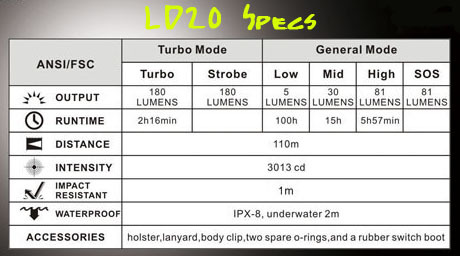 For all the Specs Geeks out there, here is what Fenix says the lights can do.